Dentrix (by Henry Schein) is the most recognizable name in the dental practice management software industry. Launched in 1989, Dentrix (by Henry Schein) is the most popular dental practice management software system on the market, and is a consistent winner of the Dentaltown Townie Choice Awards for practice management software. Dentrix has an estimated market share of 25-30% in the US, with more than 35,000 dental practices using the system. With such a strong track record, you can be assured that the software has all of the functionality needed to support tens of thousands of dental practices globally. Since Dentrix has so many features and is such a comprehensive solution, it can come with a steeper learning curve for new users, compared to more lightweight solutions. However, if you're hiring experienced staff, there's a reasonable chance that they've used the software in the past, which can help reduce their training time. If you're in the market for a new dental practice management software, then we think that it's always worth considering the most widely used option, especially given Dentrix's long track record of success. However, since the system has been around for so long, many find the user interface to be quite dated, and the system is less modern compared to some of the newer dental practice management software systems on the market. What are the different Dentrix products? Dentrix offers many different products -- so many, in fact, that it can be difficult to decide which is best for your practice. We'll walk through some of their key products. $139/month for support, and additional fees for bundles with extra functionality. When people refer to Dentrix, they're typically talking about the current version of their locally hosted practice management software, which is Dentrix G6. The software is only compatible with Windows, so Mac users will have to look for another solution. Dentrix G6 is appropriate for single location practices--if you have multiple locations and want to have a consolidated patient database, and a consolidated view of your practice, Dentrix Ascend or Dentrix Enterprise would be more appropriate choices. Since Dentrix has a strong track record of satisfying a large number of users, the product has virtually all of the functionality that you could want from your dental practice management software. We'll briefly walk through some of Dentrix's key features. 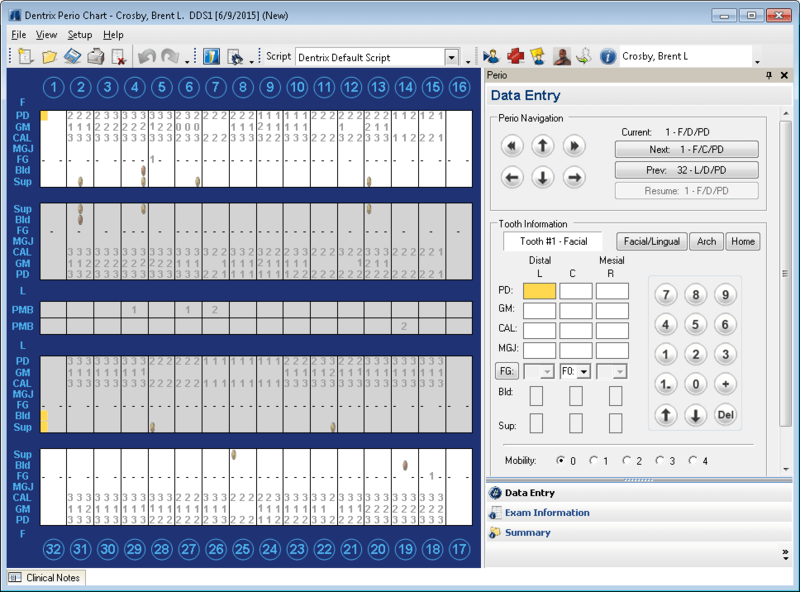 Dentrix makes charting easy; dentists can take notes by simply clicking on the odontogram. You can color-code each treatment, to indicate its status (e.g. red to indicate completed treatments, and blue to indicate recommended treatments). The software also makes it easy to find the appropriate procedure codes and document them. Whenever you complete a procedure, the information will automatically get transferred to the patient's ledger, which makes for accurate billing. If you mark certain procedures as planned, you can create treatment plans through the software, specify the sequence of procedures, and map them to different visits. You can also print treatment plans (along with the price of each procedure) and show them to patients. Dentrix also has perio charting capabilities. One nice feature of Dentrix's perio charting is that users don't have to click around to different sites to enter measurements--after you type in a measurement, the software automatically moves the cursor to the next site or tooth for you to enter your measurements. This helps saves users time, and makes perio charting faster. If you need to write prescriptions, you can do so electronically with Dentrix's ePrescribe add-on module. This streamlines the process of writing prescriptions by prepopulating patient information from Dentrix, and enables you to send information directly to the pharmacy. Based on the patient's history of prescriptions, you can also identify possible adverse drug interactions. The ability to e-prescribe is especially important in helping dentists comply with New York's I-STOP law. Dentrix comes with many standardized reports, which can help you use data to increase your practice's revenue. Though users can customize these reports by adding various filters, the software doesn't currently support custom reports. So, you're somewhat limited in creating new reports if they don't already exist. However, there are some 3rd party programs you can purchase that will enable you to query your data and generate custom reports. This would be an additional purchase that isn't included with the software, and is only compatible with Dentrix G5 and above. Dentrix includes a color-coded scheduler that allows you to book appointments, and view your office's schedule in one convenient location. 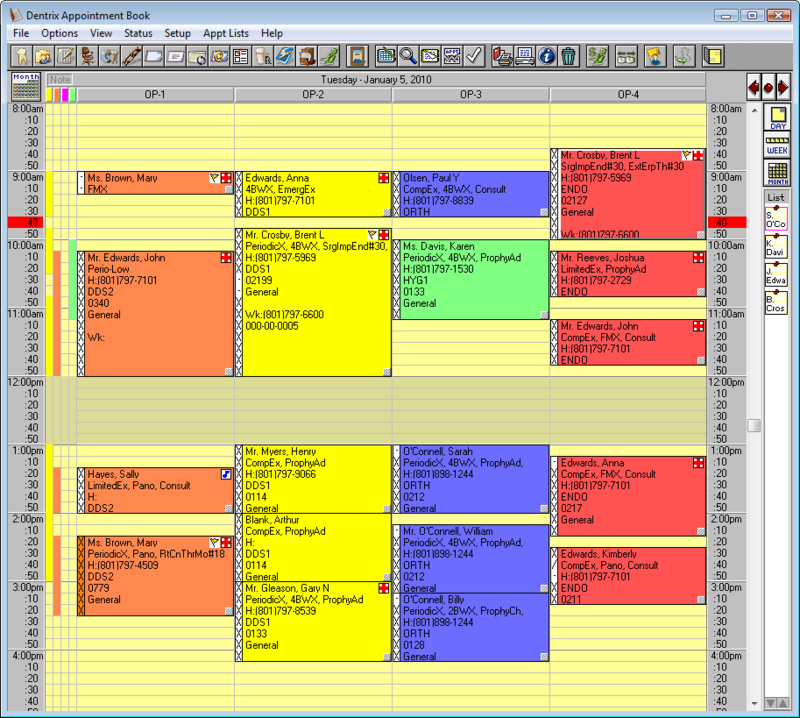 The scheduler is customizable, which means that you can filter by provider or by day, for example. You can also assign a color to each provider, and easily see each dentist's appointments and availabilities at a glance. The Dentrix Patient Kiosk helps streamline the patient check-in process by enabling patients to fill out forms and questionnaires through a tablet, instead of having to fill out paperwork on a clipboard. This is a nice touch that can give your practice a more professional feel, while improving your patients' experience. With the rise of the cloud and all of the benefits of cloud-based software, Henry Schein has more recently begun developing a cloud-based solution called Dentrix Ascend. However, this is still a relatively new solution, and was built from the ground up--it's not just Dentrix hosted on the cloud. This means that there are still some kinks being ironed out, and improvements to the product being made. Imaging is one of the challenges that cloud-based dental software faces. Dexis created an imaging solution that integrates with Dentrix Ascend, known as 'Dexis for Dentrix Ascend', which is a cloud-based imaging solution that enables users to take high-quality images and upload them directly to the cloud. However, this comes with an additional charge that should be factored into your price estimate--this is the only way to upload images to the cloud directly with Dentrix Ascend. Otherwise, you'll have to store your images locally, which takes away some of the convenience you normally get by using a cloud-based solution, since you'll still have to pay for servers and backup your data. If you're interested in cloud-based dental practice management software, but are looking for a more mature solution, then we'd suggest taking a look at Curve for solo practices, and Denticon for multi-location practices. Otherwise, if you're going to select a Dentrix product, we'd recommend choosing Dentrix G6, until Dentrix Ascend becomes more mature and overcomes some of its growing pains. Cloud-based software is difficult to develop, with many technical challenges--there's no rush to use the product in its earlier stages. Not published. Contact Dentrix Enterprise to receive a quote. With the recent rise of group dental practices, Henry Schein created Dentrix Enterprise, which was designed to address the challenges faced by group practices. Specifically, group practices may use a separate database in each location, which means that in order to get a consolidated patient profile, you'd have to pull data from each location's database. This also makes it difficult for enterprise practices to generate reports across locations and analyze their performance, since they have to query data out of each database and combine it in order to get the information that they need. Dentrix Enterprise addresses these issues by combining data from multiple locations into one centralized location. This means that you can have a single patient record, as well as a single provider record, as opposed to one record per location. Since Dentrix Enterprise is designed specifically for large group practices, its price is also substantially higher than Dentrix, which makes it unsuitable for smaller dental practices. If you are a large multi-location practice, it's worth looking into Dentrix Enterprise, as well as Denticon (by PlanetDDS), which is also designed for enterprise dental practices. These are the two most reputable solutions designed for this specific market, whereas most other products are mostly catered to smaller practices. Since there are only a limited number of commercial products that are designed for this specific market, we'd suggest that group practices look into both of these products. If you're looking for a dental practice management software system, then Henry Schein offers various Dentrix products to suit your needs. Dentrix is the most popular product, and is used by more than 35,000 dental practices. For most dental practices, Dentrix is the product from Henry Schein that would be most relevant. 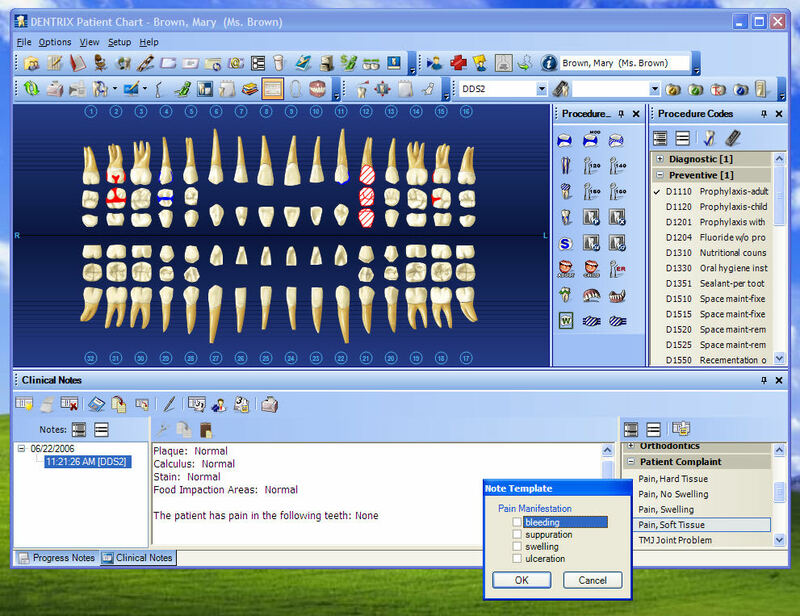 Dentrix Ascend is a good option for practices that are looking for cloud-based dental practice management software. However, since it's a newer product, it may take some time for the product to become as rich and mature as Dentrix. Dentrix Enterprise was designed specifically for group practices, and is one of few commercial products catered towards this specific market. To learn more about Dentrix, you can visit their site here. You can also read our interview with Dr. Eugene Gamble, to learn more about Dentrix from the perspective of an experienced periodontist. Patient Communication Software: Is it Worth it? Zocdoc Review: Is it Worthwhile for Dentists? What Software Does a New Dental Practice Need?